on canine and feline oncology.Cutting-edge information on the complications of cancer, pain management, and the latest treatment modalities prepares you to diagnose and treat pets with cancer rather than refer cases to a specialist.A consistent format for chapters on body system tumors includes coverage of incidence and risk factors, pathology, natural behavior of tumors, history and clinical signs, diagnostic techniques and workup, treatment options, and prognosis for specific malignancies. A systems approach to the diagnosis and management of cancer facilitates access to information about the many malignancies affecting small animal patients. 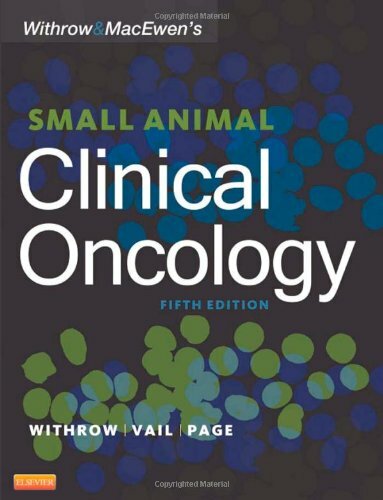 Nearly 500 color images provide accurate depictions of specific diseases and procedures.Helpful drug formularies provide quick access to information on indications, toxicities, and recommended dosages for chemotherapeutic and analgesic drugs used in cancer treatment.Expert contributors provide in-depth coverage of the most current information in his or her respective specialty in veterinary oncology.Chemotherapy protocols are included when case studies prove clinical efficacy.Discussion of compassion and supportive care for the management of pain, nutritional needs, and grief includes methods for handling the pet's pain and nutritional complications as well as the pet owner's grief when treatment is not successful.Thoroughly UPDATED chapters cover the most recent changes in the clinical management of melanoma, mast cell tumors, tumors of the skeletal system, tumors of the endocrine system, tumors of the mammary gland, urinary cancers, nervous system cancers, lymphoma, and histiocytic diseases.NEW Clinical Trials and Developmental Therapeutics chapter discusses the various phases of clinical trials as well as current challenges and opportunities in oncology drug development.NEW! A focus on the best recommended treatment options highlights therapeutic strategies that have been vetted by veterinary oncology experts.NEW co-author Dr. Rodney L. Page adds his valuable perspective, expertise, and research experience. RODNEY PAGE is co-founder, with Pete Tosh, of The Focus Group, a consulting firm that specializes in helping companies achieve, manage, and sustain profitable growth. In a career spanning over 30 years, he has worked for and with many organizations, in a variety of general management, sales, marketing, and training capacities, and has participated in several entrepreneurial ventures.